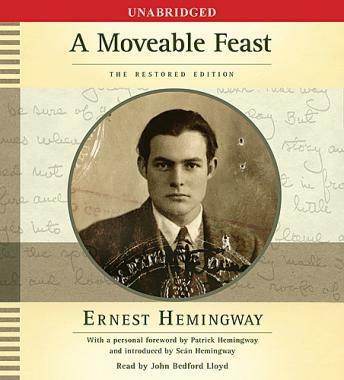 Published posthumously in 1964, A Moveable Feast remains one of Ernest Hemingway's most beloved works. Since Hemingway's personal papers were released in 1979, scholars have examined and debated the changes made to the text before publication. Now, this new special restored edition presents the original manuscript as the author intended it to be published. Featuring a personal foreword by Patrick Hemingway, Ernest's sole surviving son, and an introduction by the editor and grandson of the author, Sean Hemingway, this new edition also includes a number of unfinished, never-before-published Paris sketches revealing experiences that Hemingway had with his son, Jack, and his first wife, Hadley. Also included are irreverent portraits of other luminaries, such as F. Scott Fitzgerald and Ford Madox Ford, and insightful recollections of his own early experiments with his craft. Sure to excite critics and listeners alike, the restored edition of A Moveable Feast brilliantly evokes the exuberant mood of Paris after World War I and the unbridled creativity and unquenchable enthusiasm that Hemingway himself epitomized.